In the final stretch of my PhD program, I traveled to Portland for an annual conference. I'd been married just under three years, and earlier in the week, Joe and I rafted down the White Salmon River, during which I had a near death experience. It was an anxiety ridden week, because on top of almost dying, I had applied for tenure-track positions in my department and at another university, and everyone who had anything to do with my potentially being hired was at the conference. I was in a hotel room with a fellow graduate student and friend, my husband having already returned to Raleigh, when I burst into tears. What I really want to be is a stay-at-home mom. 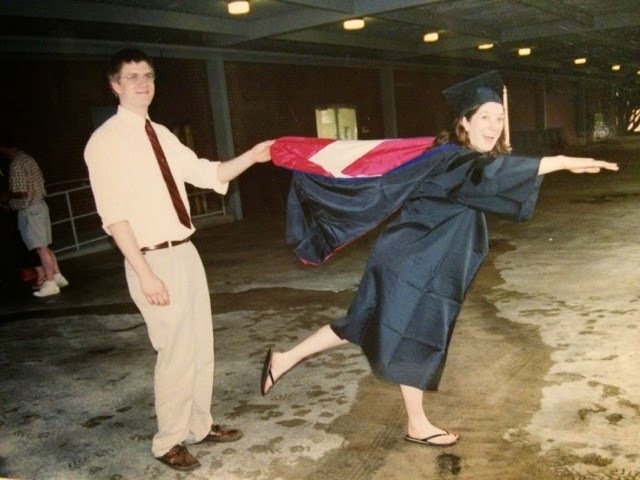 I had known since the fifth grade that I would get my PhD, and I'd always had an interest in teaching, and it had been in my plan to marry by twenty-three and have my first kid by twenty-seven (very specific, I know), but what I hadn't fully prepared for was the enormous internal conflict that would arise from seemingly competing desires. The conflict came to a head during that conference. At that point in the journey, neither a faculty position nor children were a guarantee. It wasn't as if there was an actual decision at that point for me to make, but I was in limbo. We weren't going to try to have kids until I finished my degree, but in the meantime I was starting to consider career and wondering if a career was even something I actually wanted. I cried tears for the kids I didn't yet have, for the job I wanted yet didn't want, for the fear of a life-long career at a desk with cinder block walls, for the guilt of having my education financed by foundations that expected me to use it, and for having nearly drowned beneath a waterfall in icy rapids. I didn't get either job. However, as part of my degree program, my chair had me develop a 1-hr distance course related to my research and at the end of that semester, I was offered the opportunity to create and teach a fall distance course for the department that would prepare incoming graduate students and get them up to speed on topics they'd need for other courses. Right around graduation as I was then prepping the fall course, I got pregnant with my first son. The path I have ended up on isn't conventional for academics or for moms, and I often question how it will play out long-term, but it has worked for our family the past eight years. It hasn't been without challenges, which I will address in a later post. I've learned that sometimes to reconcile competing desires, I have to be open to unconventional solutions and compromises. It's when I size myself up to other academics or other mothers that I really seem to lose my footing. As a follower of Jesus, I'm in a constant battle to take the world's measure of success completely off the table otherwise I fall to great clouds of self-doubt and disappointment. I'd love to hear from other work-at-home moms! How did you end up where you are? Do you struggle with second-guessing your role in your career or as a mom? How do you find balance in the multiple roles? Feel free to comment or shoot me a message on Facebook or Twitter. Maturity is not conferred along with the degree.